Wake, Tunes, Crew. When it comes to a boarding session out on the water, that’s really all you need. Heyday Inboards believes this so much, they have turned it into their company mantra. 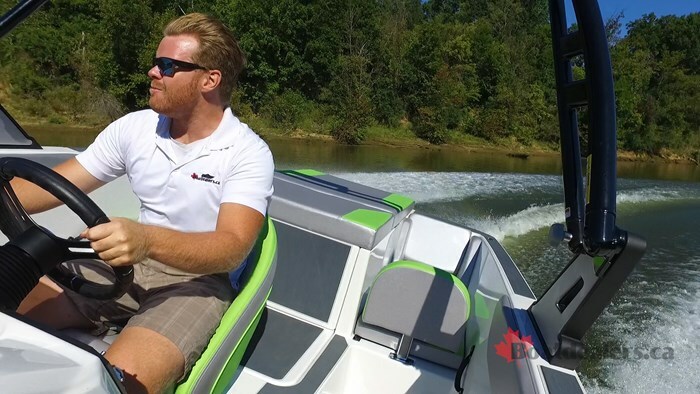 This uber simple approach is put into their boats as they also set out the mandate to make the industry’s first truly affordable inboard towboat. Enter the WT-1. Built for the weekend warrior, the guy who loves board sports and riding the waves but doesn’t have the 6-figure job that you need to afford an inboard these days, the WT-1 is a fresh take on the inboard market and it will definitely stop you in your tracks the first time you see it. Everything you see about the WT-1 is unique. From its size, to its shape, to its interior layout, it’s like John Dorton, the company’s founder, started with a blank canvas when coming up with this revolutionary idea. 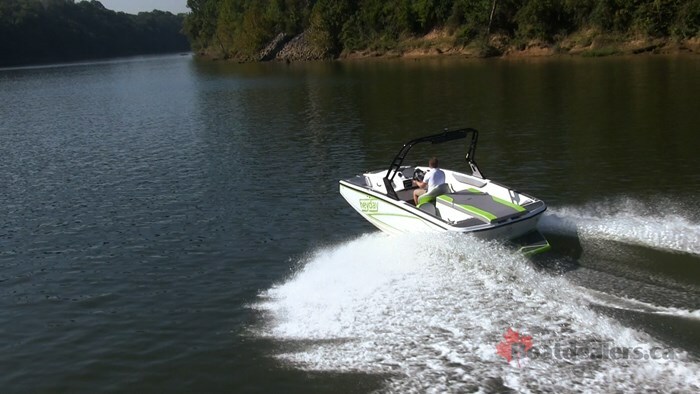 But it was actually John’s many years at Mastercraft that allowed him to figure out what he wanted to see, and how to make, the first truly affordable inboard. So it all starts with that 17-foot, 11-inch length and 8-foot beam. That’s a decent sized boat for the everyday boater, but in the world of tow sports where size is king, that’s quite quaint. But naturally, the bigger the boat, the bigger the price tag, so that was the first major element to keeping the cost of this boat down. When you’re working with a footprint of that size, you have to be creative with your use of space and that’s exactly what John was. 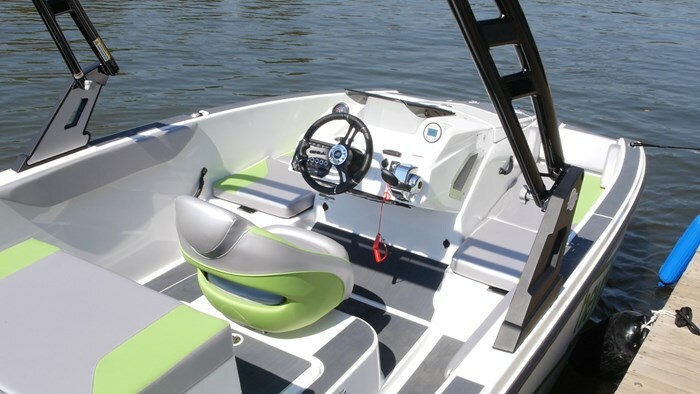 In boat design, something that takes up the most amount of space is bulkheads. So in your traditional dual console boat, you’re actually losing a lot of prime real estate. So the helm on the WT-1 is placed directly in the middle of the boat. Directly forward of the console is a large locker. It is large enough that you could easily fit a surfboard or a wakeboard inside. Storage is something that also takes up a lot of space, so to create it, you again have to get creative. But of course, this boat is about Wake, Tunes and CREW, so where is everyone going to sit? Well flanking that center console is two large, rear facing, lounge seats that tuck you right up to the edge of the bow. Don’t want to be that far away from the action? Backrests fit into the space between the two cushions to give you upright jump seats that are much closer to mid-ship. With inboards these days it’s all about the large, touch screen displays. Some manufacturers have even gotten rid of traditional gauges completely. As cool as these gadgets are, they’re quite expensive. Heyday keeps it simple with a Tach and a Zero Off Speed control gauge. That’s really all you need! Billeted aluminum toggle switches make controlling your systems as simple as on and off. For your ballast control you have two switches: left and right. They have two settings: fill and empty. It really doesn’t get easier than that. But say you like gadgets and touchscreens, well worry not. You’ll notice there is a large, blank portion of the helm dash. Well that’s where you can put your Tablet mount, which you can then download the Heyday app, and with the addition of your tablet you now have a virtual helm, just like the other guys. You can see all your info, as well as control your tunes through the WetSounds Bluetooth Soundbar - the “Tunes” portion of the company mantra. The rear half of the boat is almost like a mirror image of the front half only instead of a helm there is an engine dog house. On top of this dog house is thick, probably 2-inch, foam padding to give you a large sunpad to just chill out. On either side of the doghouse are two large lounges, same as in the bow. The backrest of these lounges are essentially the transom, so that will have you facing forward. This is great for when you’re cruising, but what about when the action is behind the boat? 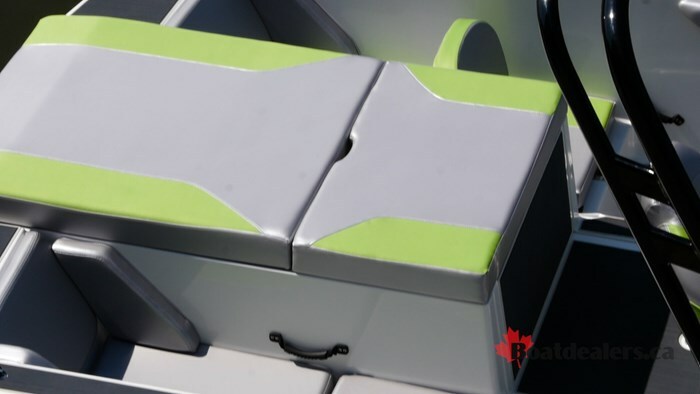 Well those same filler cushions that you have for the bow can be used on these loungers as well to give you both jump seats, but also a backrest for when you want to face the rear. It’s a layout that gives you the most amount of functionality in the smallest amount of space but there are going to be some inevitabilities. One of which is that you will probably have to walk on the gunnels to get around people. 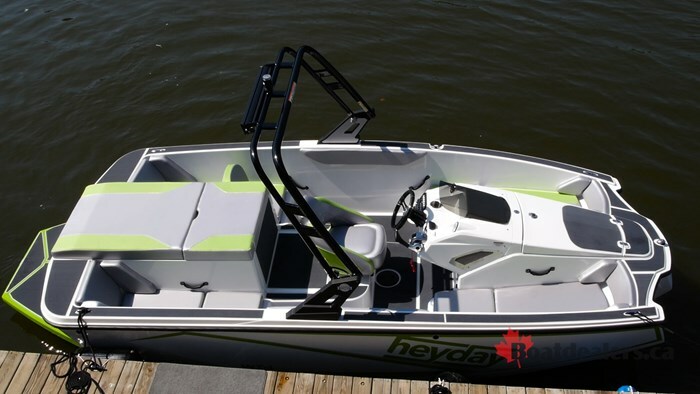 To help with this Heyday has put SeaDek along all of the gunnels and anywhere else you might step to avoid slipping. 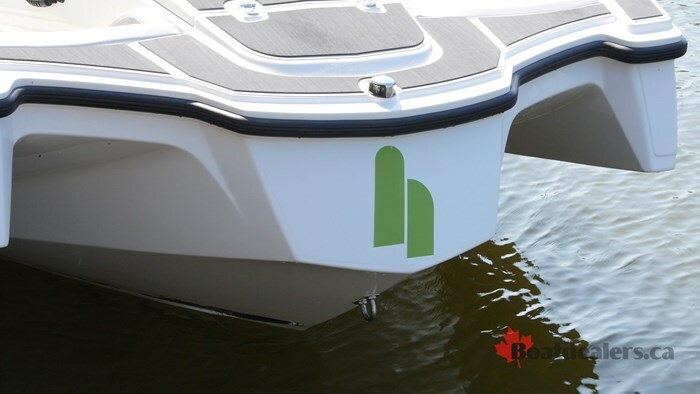 One of the other cool things Heyday does is they use Vinyl graphics to colour the hull sides of your boat. Your deck and hull are still gel, but the side of the hull is covered in one large vinyl decal. The benefits of this is it again, keeps the cost down, but also say you want to switch up your boat’s look in a year, not a problem! Powering the WT-1 is something that inboard enthusiasts will be familiar with and that is the PCM Challenger engine, putting out 350-hp. 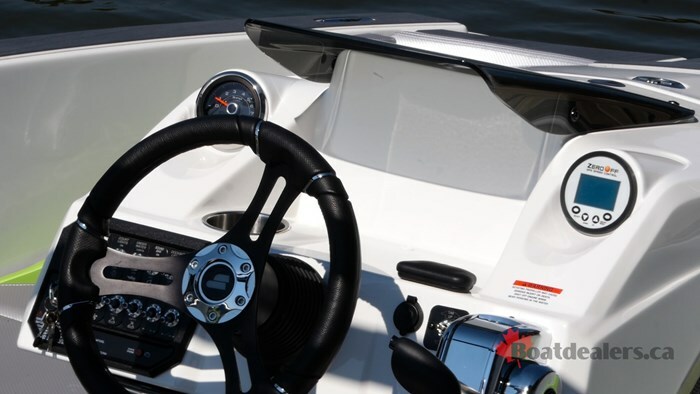 PCM is a trusted name in inboard power, and 350-hp is a lot of ponies for an almost 18 foot boat. So I was eager to finally get out on the water behind this beauty. One of the benefits of being pint sized is how manageable the WT-1 was at the dock. One thing to remember is with an inboard you can’t steer. Since it relies on a rudder to direct thrust, you’re stuck being pulled in the direction of the prop spin when you reverse. This was a non-issue with the WT-1 as it’s compact size made it easy to get away from the dock and spin in any direction easily. I could feel the power of the PCM Challenger rumbling through the boat as I idled a safe distance away from the dock. When I put the throttle down, I was made aware of what would happen but it was something that had to be experienced to believe. The WT-1 shot out of the water like a jetski. With all that torque in such a small boat it gives you a great power to weight ratio and I was up and moving like I was shot out of a canon. 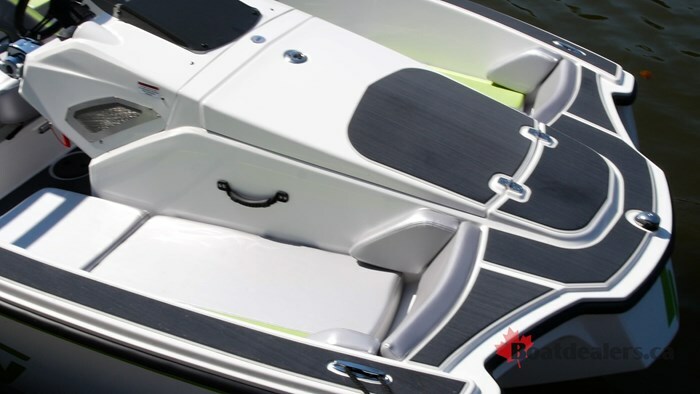 Since there is so much power with a small running surface, Heyday has equipped the WT-1 with a large center mounted trim tab. This helps keep the bow down when coming out of the hole and then you can adjust it when you’re on plane to give you the best run, just like you would with a normal trim switch. With just me on board, and no ballast filled I was still curious as how the wake would look so I backed down to wakeboard speeds of about 21-mph and I was immediately impressed. The wake was clean, with a large transition and nice ramp to it. It had a great size to it and was as good as any inboard wake that I have seen in awhile. The magic of that is thanks to the WT-1’s flat bottom, rounded chines and 117-degree transom angle. This gives the water a clean surface to break off of and the sharp transom angle causes a reaction in the water similar to like a point break in the ocean for surfers. Speaking of which, that’s what I really wanted to do. I have been following Heyday on Instagram for some time and have been foaming at the mouth for a chance to surf this boat. Picking up my board and more people, we began to fill the ballast. Since I surf the right side of the boat, I hit the “Fill Right” switch and that was it, so simple. We hooked up the rope, set the speed on the Zero Off system and soon as we heard the water overflow sound, indicating the tanks were full, it was time to ride. Hopping into the river in Tennessee I wasn’t sure what to expect. To get a big wave you need to displace a large amount of water, and we didn’t have that many people in this 18-foot boat, so the math didn’t add up. But I said “Ready” and we were off. The first thing that caught my attention was how immediate the wave developed. Usually behind other boats you have to wait a minute, with the WT-1 it was almost instantaneous. And wouldn’t you know it but it was spectacular. The wave was clean, long, had good height to it and had plenty of pop. I’m about 200 lbs and ride a smaller board, and I had no issues riding this wave. It was fun and playful yet very forgiving. The sweet spot was nice and far back from the boat giving you plenty of room to build speed for tricks, but also making it forgiving and easier to stay on the wave. After taking a few laps up and down the river I had to remind myself I was here to work so I hopped back in the boat with a large smile on my face. My surprise and adoration were hard to hide. The WT-1 is legit. It’s not going to be for everyone, but what I love is how they’re making inboard boats accessible in a fun and creative way. It’s a unique boat that will turn heads. First because of it’s unique design and layout, and second because of the massive wave it throws.